K-9 Komfort 1 in. Deluxe Leather D-end Collar. $22.95. Great collar with the name badge. What a gorgeous collar! The color matches my dog perfectly, and the I.D. is so classy. The leather is top quality. I was very impressed. The price was so good, too. Great collar. Great customer service and fast shipping! Excellent product and quality. Our dogs spend lots of time outdoors, therefore the collar gets wet and muddy. That doesn't seem to affect the durability. I can strongly recommend this product. Chip loves his new collar. It's so comfortable, he doesn't even know he is wearing one. This collar is very nice. I love it, and my dog loves it. Highly recommend it. Quality product at an amazing price. Can't say enough about it. High quality collar. More than I expected. It will last longer than the dog. I love it. F Black Lab. Hunts. Family pet. Great Fit, Durable, Excellent Quality and Stitching, Very Good Looking. Exceeded expectations. Exceeded my expectations! Very nice collar. Fit and looks great. Highly recommend. Bought one for each of my Pits. The quality is great, and with the custom name plates they truly look sharp on both of them. Superb quality collar. I have a big, strong adolescent female GSD that needs a secure collar. This is a great one. I got the brass name plate, and I recommend to anyone that buys this to bend the collar in the area of the plate (I used a baseball as a curved fulcrum to bend it cleanly against) so it will fit your dog's neck better. Also, flex the leather a few times really good so it will be more pliable. This is exactly what I was looking for for a wear collar, and I highly recommend this one as it will give you a lot for your money. Excellent collar, and excellent craftsmanship. Have not received. Still on backorder. 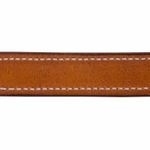 "Beautiful collar of excellent quality leather and durable brass fittings." 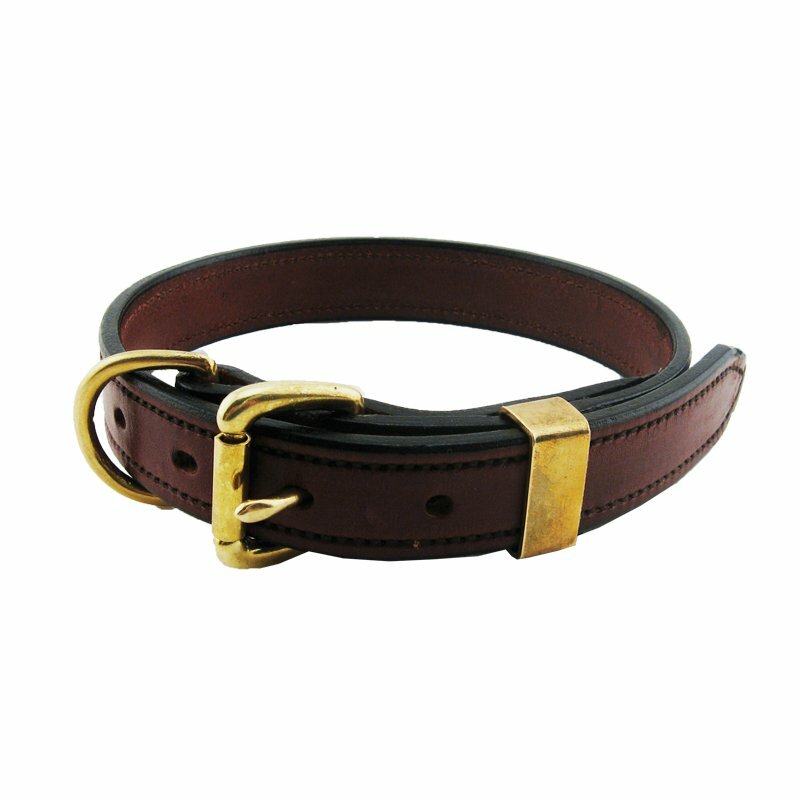 Beautiful collar of excellent quality leather and durable brass fittings. Exactly what I wanted for my dogs working stock and herding training and trialling. Very good quality. Thank you very much! "Would recommend. Also, excellent service." Love the collar, just what I was looking for at a reasonable price. Would recommend. Also, excellent service. This collar is the best one I have ever gotten for one of my dogs. The price is so good for the amazing quality of this collar. I will definitely buy another one! We bought this leather collar for our dog and love it! It has some natural wear and tear after about a month of use, but we are okay with that - it's great quality. The D-ring clangs against the buckle when he walks - but again the sound doesn't bother us. We know this collar will last a lifetime! Very fine quality, fast shipping and outstanding customer service. Will definitely buy again. 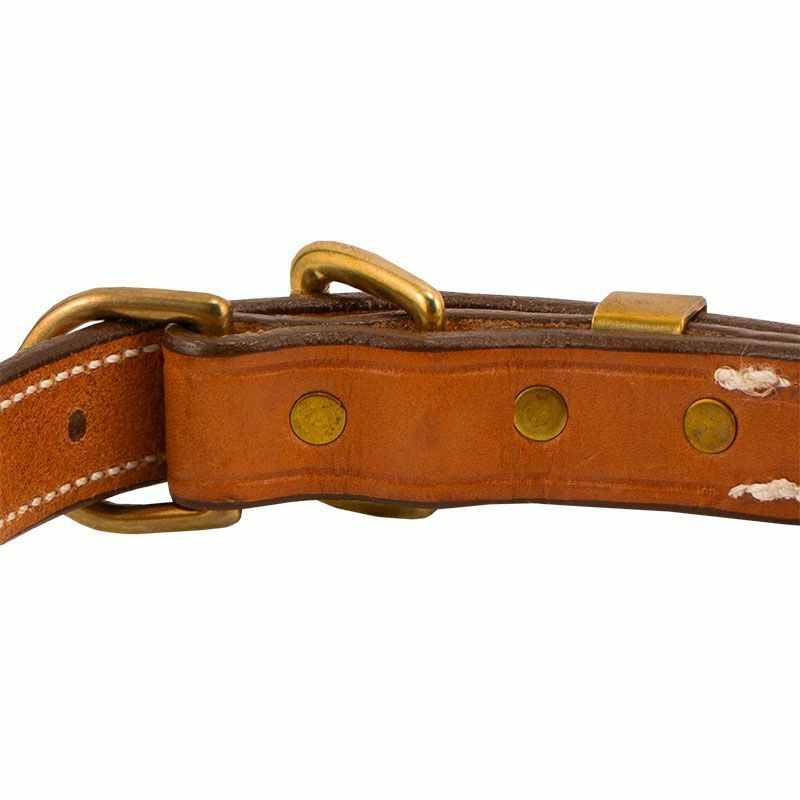 I have looked at hundreds of collars, and never found something of this quality. 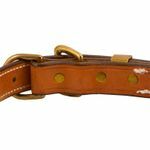 I was very hesitant ordering a collar online, because my search had shown me that most, if not all, of the collars on the market were cheep and flimsy. Was I surprised! This is the collar I have been looking for. It is built like a tank, and when I grab on to it, the dog stays put. There is no stretching and bending, just a very secure feeling that you have complete control of the dog. The dogs, three standard poodles, like the collars very much, have made no attempts to remove them, although they were very interested in checking out each other after the install. They look very dashing in their new neckwear. Thanks for making a stellar product, I am a customer for life. I ordered for only one of my dogs, but I should have ordered one for both of my dogs! I love this collar for my dog. 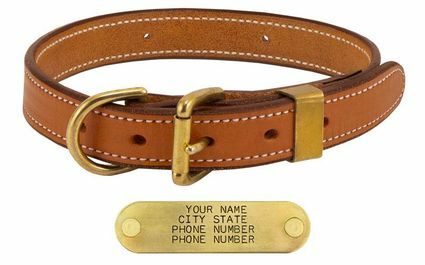 It's made very well, and the attached name plates are great for my dog. My dog likes to chew ID tags off his collars, so this collar with the nameplates is great. All the information is on the collar, and he can't chew it up. I will be buying this same collar again when my new puppy gets bigger, so she can have one too. These collars are great! Beautiful collar. I ordered it a little short, so be careful when you measure it, but that was my fault. It is my second collar from Gun Dog, just took the same measurement, but this collar was a little different. I love these collars! They look beautiful, and they last. This is a really beautiful collar. High quality leather and well made. Would recommend! I returned it for the 3/4 inch collar. I have 2 collars for my dog and this one is slightly stiffer. The keeper for the leather is my favorite part and it doesn't allow the leather to flap around or be chewed by the pups. excellent quality collar. name plate is an added bonus. My dog has been in the water daily with it for the last couple weeks and it is like new. Fits exactly as stated when following the sizing guidelines. I will definitely be buying one for my other dog. Practical, functional and stylish love them both. Second collar ordered. Excellent product with prompt delivery. "Very handsome and well made collar." Very handsome and well made collar. A good value. "This is a great, well made collar." This is a great, well made collar. The only thing I wish it had was either a smaller D-end or another link to hang license/tags on. Otherwise, great value and great product. "I'm 100% happy with my purchase." I'm 100% happy with my purchase. 100% better any collar from Petco. My dog loves it. "I absolutely love the the K-9 Komfort Deluxe collar. It looks beautiful." I absolutely love the the K-9 Komfort Deluxe collar. It looks beautiful. The name tag is handsome, and the quality of the leather and workmanship is superior to any other collar I have ever bought. I have already recommended you to many friends, and I will be a recurring customer. "This is truly a great collar." This is truly a great collar. The quality of the materials and manufacture is quite evident. While our dog is only medium size, she plays like the roughest big dog out there. She's lost her tags several times, but with this collar, we will never fear again her getting lost without ID. I would highly recommend this particular collar for the strength, craftsmanship, and value to anyone in the market. "The quality of the leather is great." The quality of the leather is great. I like the specific buckles, and the way the ring stays in place. I did order a little large. The directions given for ordering are correct. I was between sizes and ordered up. Should have stayed with the recommendations. Even better quality than I expected. Very sturdy, and believe it will last for years. "Excellent value and great service." Beautiful, sturdy collar for my rough & tumble dogs. I love the name plate. No more lost tags! Excellent value and great service. Great looking collar. I love it. "Very well made collar, and looks nice too." Very well made collar, and looks nice too. Ordered this and another collar, both with nameplates, and received them within a couple days. Very pleased with the collars and customer service. Perfect. Great quality, and the name tag is just what we wanted. Thanks. "All I can say is WOW. Incredible service." All I can say is WOW. Incredible service. I can't believe the price for the quality of the collar. Better than anything else I have seen. I am a customer for life. "I really like this collar." I really like this collar. Every collar I have purchased from Steve seemed to last forever once the dog has stopped growing. My last collar from Steve was 2 yrs. old and like new, however after a run in with a skunk, I didn't want to even try and clean it. It still looked great while I was triple bagging it and taking it to the dump. My new one came in a couple of days, so my dog didn't have to wait long for her new I.D. and collar. Thanks Steve! "Great collar and Gun Dog Supply is a great place to purchase anything for your dog." 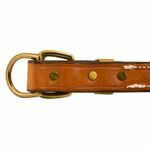 Great collar and Gun Dog Supply is a great place to purchase anything for your dog. They made everything right even when I was the one who messed up my order! Great Collars we use them. They really hold up well. The quality is excellent. "This collar looks very good." This collar looks very good. 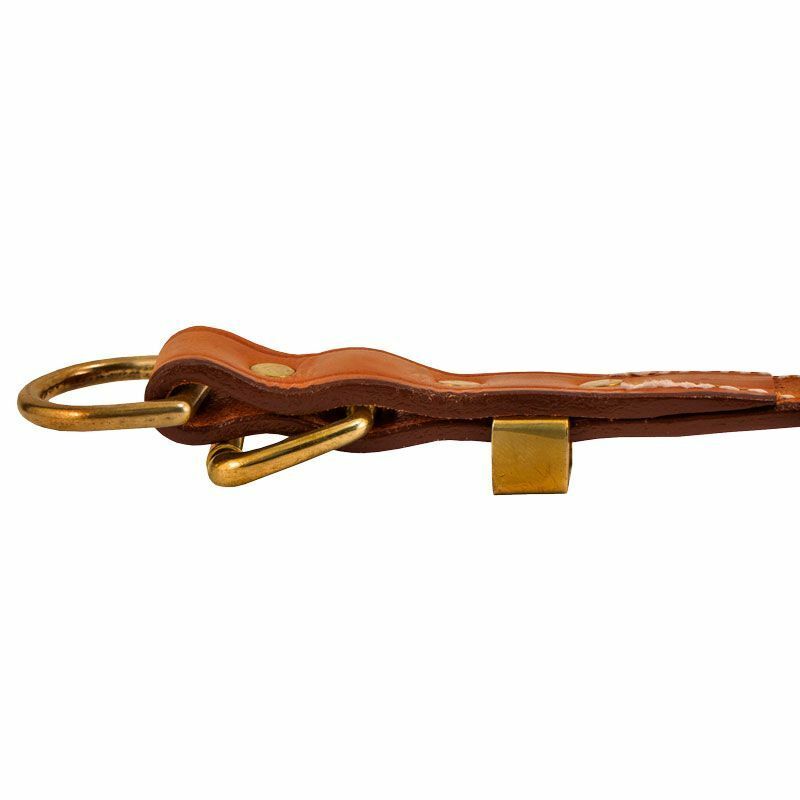 Brass buckle is very sturdy and keeps excess leather strap from moving around. This collar is wonderful! I've had it for a couple of years now and have received many complements. Every time I think about replacing it I stop because it still looks and works great. I MUCH prefer the brass nameplate- I've lost several hang tags on dogs over the years, not to mention annoying jingling. I've also had the contact info earn its worth when my lab learned to open a sliding door while I was at work- they called both numbers and he was soon returned. I'll never be able to live without a nameplate-style collar not. I can't recommend this collar strongly enough- he's been in and out of the water countless times and worn it in all 4 seasons and it's still soft and nice-looking. "It's a beautiful collar, and my friend loved it!" I bought this as a gift. 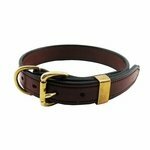 I have already purchased 3 other collars from this site for my personal dogs. This one is such a great quality leather, and the stitching makes it look like I spent a lot of money on this gift! It's a beautiful collar, and my friend loved it! "Beautiful collar! The craftsmanship is top notch." Beautiful collar! The craftsmanship is top notch. You will not find a nicer leather collar for less $$. "I gave the collar to the doctor that I work with, and he absolutely loved it!" I gave the collar to the doctor that I work with, and he absolutely loved it!!! It was beautiful! Very nice quality!!! I am super pleased. Wonderful customer service! Great company that I highly recommend! "Perfect, and they loved it!!" Gave as a gift. Perfect, and they loved it!! Doberman Pinscher. Family pet. Competes. Collar is well made. I have not had any issues with quality or durability. Would recommend. Handsome and sturdy. Excellent collar. Beautiful collar. Lots of comments on it already. Shipped very quickly. I love doing business with you. "Durable, thick leather and heavy brass." Third collar; out grew one, skunked another. Durable, thick leather and heavy brass. My dog loves it, and he looks great. Great quality. I forgot to list the size. They called me to make sure they knew what I wanted. Nice people to deal with. Thank you. "Surprised at the quality at the price." Surprised at the quality at the price. It looks very handsome on my dogs neck. At the dog park other owners were positively commenting on it and one even ordered one for her dog on the spot. "It is beautiful and looks great on Luke." It is beautiful and looks great on Luke. I was impressed with the quality. The quality is outstanding. It looks good on my dog. "Their service is 5 star, and their products have exceeded my expectations." This is the second time I've used Gun Dog Supply. Their service is 5 star, and their products have exceeded my expectations. Pros: Stitching is great. Leather is great. Construction is great. Very happy. I think it'll last years. Con: However, there is a slight annoyance caused by the design where the leashing ring constantly clinks against the buckle. My dog was very anxious about this. A little piece of Velcro fabric strategically placed on the ring fixed it, but be aware if you have an anxious dog. This is a good looking collar, and the name plate looks great! The only problem I have is the size. I thought I measured correctly, but the collar has more leftover length than I expected. "Hardware, leather, and workmanship are of the highest quality." Hardware, leather, and workmanship are of the highest quality. Really nice collar. Leather is great quality, but the buckle is slightly odd and a little difficult to take off. It is not a big deal, and I still recommend this collar. I also wished I ordered a size smaller. Overall a great value. These collars are great. We oiled ours to soften them up and have received many compliments. "Nice look and looks great on my dog." Beautiful and well made. Only problem is I wish I had ordered the smaller size. I opted to go with the 18-21 inch size because my dog's neck measured at 18&quot;. The smaller size would have worked better, so there wouldn't be so much extra strap. I haven't used it yet, but it is a solid collar that can withstand strong breeds. This collar is pretty and seems sturdy, but within a week of putting it on our dog, the wax(?) coating on the edges of the leather started peeling off. I think once it is all gone it will look nice, but for the last couple weeks it has been leaving black stuff all over. Seems to run large. Beautiful color of leather though. This is my second leather collar and the design has changed. The extra brass fitting to tuck the tab in is not as convenient as the earlier style where the D-ring was where the tab was tucked. I would rank the original style a 5-star and the current collar a 3-star. The workmanship quality of the collar, however, is excellent for both styles. 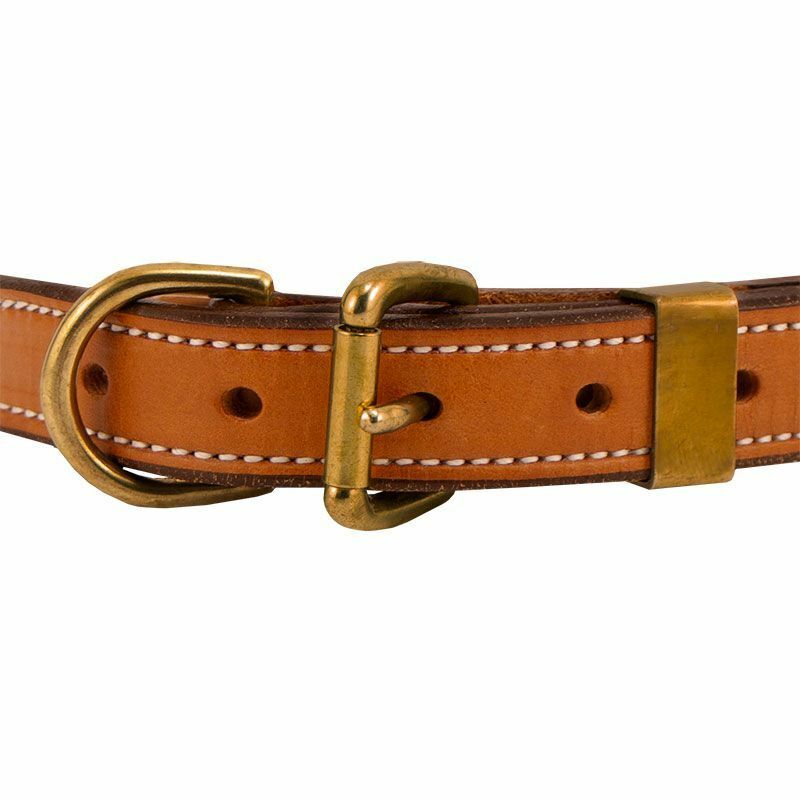 The K-9 Komfort Deluxe leather collar is available in Mahogany and London Tan. 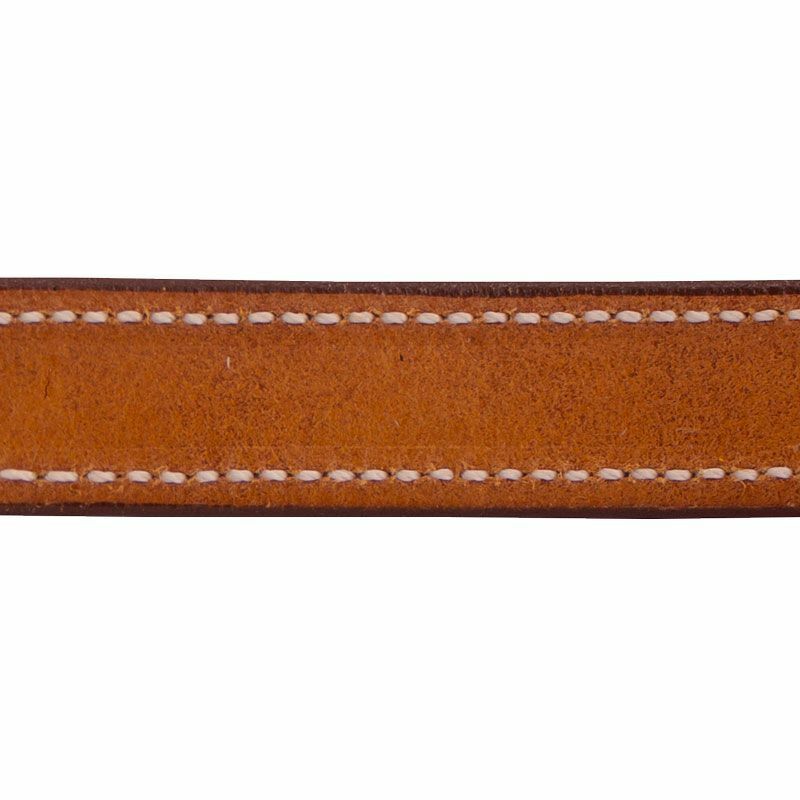 D-end collar is cut from northern U.S. cowhide for thicker, more durable leather. 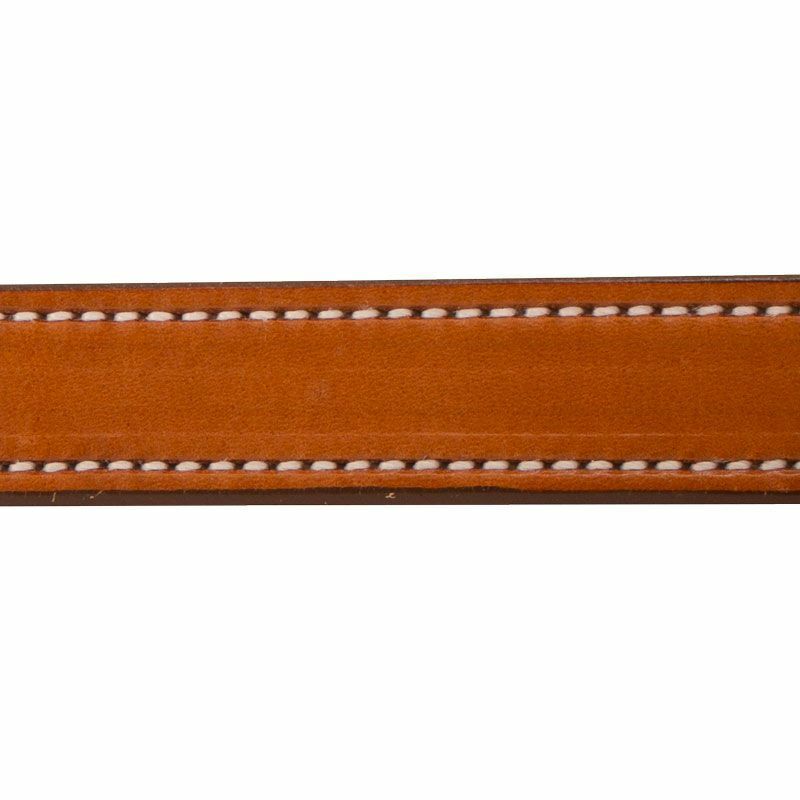 An English Bridle Leather finish makes this collar more pliable and gives it consistent color. 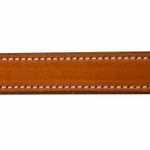 English Bridle Leather is a drier tannage for a much nicer, non-oily feel. Hand finished edges. Solid brass hardware. 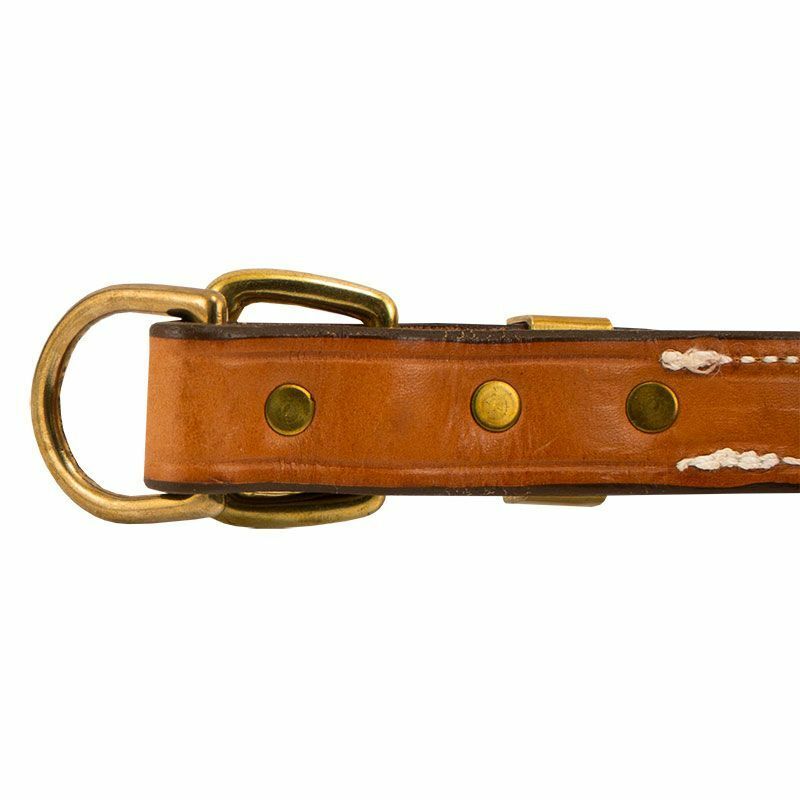 This collar has a roller buckle, D-end and square keeper. Welded hardware. Average 8 lock stitches per inch. All K-9 Komfort products are proudly made in the USA.